Does anyone know the origin of the chopped salad? I’m guessing some fancy restaurant somewhere came up with the idea, which was then picked up and glorified by California Pizza Kitchen. Strange that I think of CPK more for their chopped salads than their pizzas… Anyway, I don’t know about you, but I couldn’t eat a salad any other way now– tons of interesting ingredients, everything chopped into tiny pieces, tossed with a very complementary themed dressing, so that each and every single bite is full of every flavor. So. Yum. I think a lot of people still think of “salad” as a bowl of iceberg (or maybe romaine) lettuce with some sliced cucumbers and tomato, and a glob of bottled dressing on the top. If that’s you, don’t worry; let’s go on an adventure! I’ll be your guide, because the weather’s getting warmer and I make a lot of interesting chopped dinner salads. You’ll learn that salads aren’t just for side dishes any more. Oh, no, they’re quite a complete and filling meal with every food group under the sun, and they have the ability to transport you to another region or country in the matter of a bite. Craving a quick trip to the southwest? How about Thailand, or the Mediterranean? Oh yeah, there’s a chopped salad for that. I was thinking about Thai Chopped Chicken Salad with Peanut Dressing the other day, but not really. So I made this version instead. Shredded Napa cabbage instead of lettuce. Baked sesame tofu, which is completely delicious. Edamame, which makes you feel like a really exotic eater, even though it’s just a bean in the freezer section, and red quinoa, because I know Pinners love quinoa, especially if it’s red. Toss it all in a deliciously creamy and nutty tahini based dressing (or you could use peanut butter, but why not take a leap?). Quick and easy dinner salad, with leftovers for lunch. Bonus, because of the tofu, edamame and quinoa, it’s super protein packed and fills you up with happy, healthy stuff. This looks like a long ingredients list, but it’s really so easy. 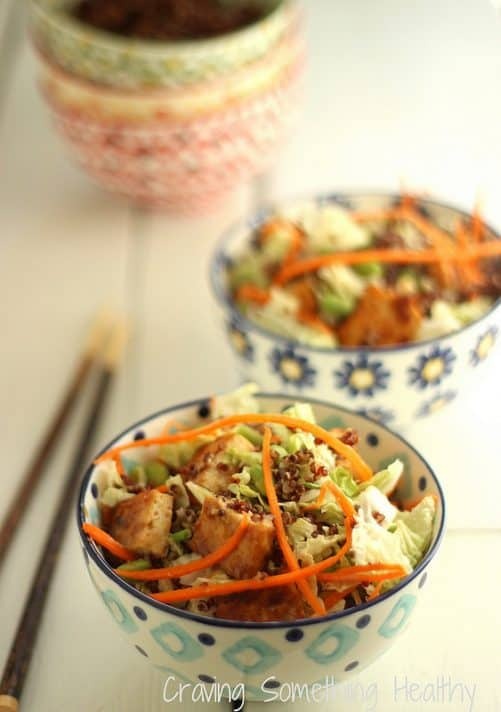 And – mostly the same ingredients are used in the tofu marinade and the dressing. You only need about 1 cup of uncooked quinoa (about 2 1/2-3 cups cooked) but make more and freeze the extra for a later meal. Make the quinoa, tofu and dressing ahead of time and just assemble it when you’re ready to eat. 1 pound extra firm tofu drained and pressed to remove any excess water. Preheat oven to 375 degrees. Line a baking pan with foil and spray with non-stick spray. Slice tofu into 1/2-inch thick slabs. Mix together tofu marinade ingredients (sesame oil, soy sauce, rice vinegar, water, chili paste and tahini) in a medium bowl. Add tofu and gently toss well to combine. Spread tofu pieces in a single layer on baking sheet, and bake for 15-20 minutes, or until golden and firm in texture, flipping pieces about halfway through. Remove from oven when baked to desired consistency, and let cool to room temperature. While tofu bakes, add quinoa to a medium saucepan, with 2 cups water and salt if desired. Bring to a boil, then reduce heat, cover and let simmer for about 15 minutes, or until quinoa is tender and water is absorbed. Fluff with a fork, and let cool. Combine shredded cabbage, edamame, carrots, and scallions in a large salad or mixing bowl. Toss well to combine and set aside. Combine dressing ingredients in a small bowl or jar and whisk or shake well to combine. Cut cooled tofu into 1-inch chunks if desired. 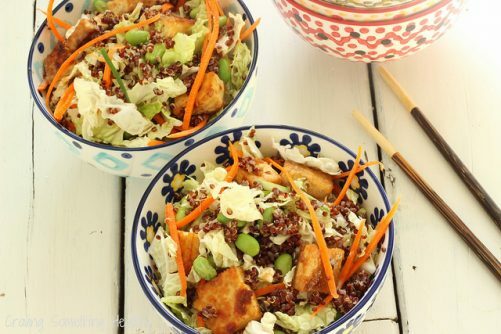 Toss tofu and quinoa with vegetables and toss with desired amount of dressing. What’s your favorite chopped salad? Do you make it at home, or just eat it at CPK? 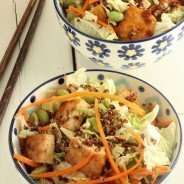 The post Sesame Tofu Chopped Salad With Red Quinoa appeared first on Craving Something Healthy. I’m always looking for a tasty way to use tofu and this looks great! It’s hot here in LA so this salad is on my must try list. Thanks!